Hostel Soca Rocks i Bovec, Slovenia: Bestill nå! For reasonable price Soča Rocks property offers double rooms and six beds dormitories with bunk beds. While staying in the property, guest can enjoy spacious common room, fully equipment kitchen, lively bar and massive barbeque area. 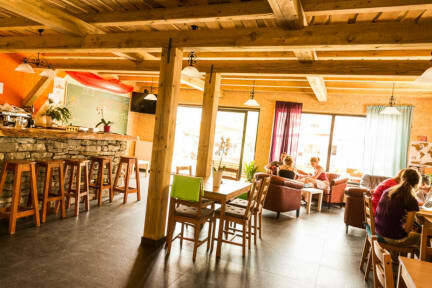 Hostel Soča rocks owns a sport agency AKTIVNI PLANET(www.aktivniplanet.si) through which you can book rafting, kayaking, hiking, mountain biking, ziplining etc. directly. There is a 4% surcharge on card payments. Taxes not included - occupancy tax 1.26 EUR per person per night. Breakfast not included but there are always some ingredients to cook with. Otherwise we can also organize a breakfast in the nearby hotel.